Why bother to rent a room at the chalet when you can own your own? The snow is starting to fall and ski resorts around the country are opening up, as early birds take to the slopes. If you’re itching to schuss with style, take a look at these 10 gorgeous ski retreats where après-ski means returning to decadent living in which heated indoor pools, home theaters, and wine cellars are the norm after you’ve navigated bone-jarring double-black diamond runs. No, that’s not a ski lodge — that’s a $20 million home for sale. 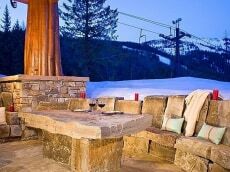 Located along the Chair 3 Tenderfoot Lift of the Whitefish Ski Resort in Montana, this massive stone-and-timbered mountain getaway on 1.34 acres offers warm elegance with 14,958 square feet of living space, and includes seven bedrooms and eight bathrooms. Watch movies in the family theater on rich, plush-red lounges, or take in views of the Whitefish slopes and Bad Rock Canyon, plus peaks of the Great Bear Wilderness and Glacier National Park from the multiple decks. Additional features: elevator, humidity controlled ski locker room, and remote access to security system. No need to lug your ski gear to the lodge if you own this 13,536 square foot beauty that offers direct ski-in-ski-out access onto Deer Valley’s Mountaineer ski run, which connects to the four-person Deer Crest mountain chair lift. Take in panoramic mountain views from 4,500 square feet of heated decks and a patio. Amenities include outdoor pool, spa and waterfall, elevator, golf simulator, theater, DJ booth, native trout aquarium, steam room, sauna, and day spa. House is being sold furnished with some art exclusions. More Park City real estate from Zillow. Aspen’s Silver Queen Gondola glides quietly overhead as you ski out the door to start the day on one of the world’s most glamorous and exciting ski mountains. Return to this three-story contemporary ski estate and enjoy a private massage or the steam room. The 9,056 square foot home has seven bedrooms, nine bathrooms and even a separate caretaker’s apartment. And one will never go cold with six gas fireplaces scattered about. Other features include an outdoor kitchen, library, exercise room, theater, wine room, ski room, large entertainment area with wet bar and room for billiards and poker tables, elevator, snowmelt decks, driveway and walkways. 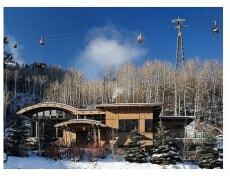 More Aspen real estate from Zillow. Snow not to your liking today? Then, attack your own massive indoor rock-climbing wall that has several “cracks” modeled after rock faces found on Yosemite, Joshua Tree and climbing spots around the world. Located within the Canyons Ski Resort, this home was featured in an episode of MTV’s Teen Cribs, which follows an entrepreneurial dad and an adventuresome family who have every amusement imaginable at their fingertips. Inside are open spaces with curved walls and floating staircases and the entryway is filled with 19th century pre-Impressionism art. Other play areas include a spacious game room with pool and foosball tables, a home theater, and a family room with central control panel for the home’s electronics. Furnishings are negotiable. Tuscany comes to Aspen in this 18th-century inspired estate built from 40,000 square feet of hand-cut limestone. Featured on VH1’s “Fabulous Life Celebrity Real Estate Splurges,” this 16,000 squqre foot estate sits on 2 acres of land. Views of the surrounding meadows and Mt. Sopris and Mt. Daley can be enjoyed from the 5,000 square feet of patios and decks! In addition to seven bedrooms and seven full baths are a massive great room, large kitchen with two islands, plush home theater, exercise room with steam room, library with bar, wine cellar, spa, fire pit, and a stream that runs though the back of the property and into a large pond with a 15-foot waterfall. The only thing missing is an indoor pool. Maybe that’s why the original price of $43.8 million in 2008 has been lowered to $35,750,000. Yes, there are some of the requisite timber-and-beam touches, but this Sun Valley-area estate is more reminiscent of an estate in southern Italy. Choose to entertain on the terrace by the infinity edge pool or in the Italian wine cafe designed like a grotto with a contoured brick ceiling. This 12,057 square foot family estate contains seven bedrooms and eight baths and was designed for large groups, but can be scaled down for smaller gatherings. It's located in close proximity to Sun Valley and the Warm Springs section of Sun Valley’s Bald Mountain. Located at the base of Wyoming’s challenging Jackson Hole Ski Resort, this grand rock-and-timber masterpiece sits on 10.63 private acres overlooking streams and gardens. The home fits in with its rugged surroundings in Grand Teton National Park and contains more than 23,000 squqre feet, including seven bedrooms, seven baths, guest quarters, a 12-seat theater, two offices, an extensive 4,000-bottle wine cellar, 1,200-sq ft professional gym, elevator and koi ponds. Located minutes from the gondola. Surprise, surprise! New York state breaks the West Coast stranglehold of glitzy ski homes with this rustic Lake Placid, N.Y., offering. While this home is not glitzy in the traditional sense, it does demand some notice. 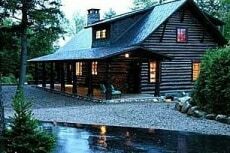 Known as Camp Balsam, this 13,500 square foot multi-building compound is on four acres on a peninsula jutting into Lake Placid and combines elements of feng shui and green technology. The three-story main residence contains an elevator, four suites, plus a two-bedroom apartment. Also on the property is a restored log cabin-style antique guest house with four bedrooms. Other features include a media room, gym, spa, wine cellar, winterized boathouse, lakeside bath house and an indoor pool. Whiteface ski area, which has the greatest vertical drop in the East and where the Olympics were held in 1980 and 1932, is just 12 miles away. More Lake Placid real estate from Zillow. Traverse down the slopes and right onto the doorstep of this cheery yellow, Norwegian Lodge-style home that sits at the base of Vail, the largest ski resort in the U.S. 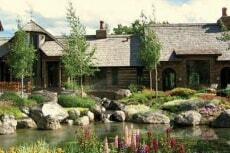 This home contains 8,308 square feet, six bedrooms and six-and-a-half baths on one-half acre of prime Vail real estate. Heavy woods are pervasive inside the home with walls, floors, box-beamed ceilings wrapping the surroundings. The home’s great room contains a magnificent fireplace and stairs lead up to an exposed balcony and bookshelves. Tasteful stone patios surround the home and inside is a heated lap pool. More Vail real estate from Zillow. Yes, we saved the best for last because let’s face it: All others pale in comparison to this incredible property that is one of the most expensive homes for sale on Zillow. 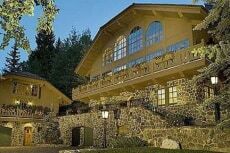 Owned by Joel Horowitz, the co-founder of Tommy Hilfiger, this northern European-inspired mountain estate sits on 210 acres overlooking Lake Tahoe, plus it has its own private lake. The main residence comprises 20,000 square feet, plus there are seven other buildings: conservatory, guest residence, art studio, boat house pavilion, gymnasium with indoor basketball court, stable, and additional residence for guest and staff. Additionally, there are two par-3 golf holes, 16-car garage, and a gatehouse. Minutes to the Tahoe ski resorts. Top 10 Most Expensive Homes in the U.S.
Top 10 Unique Homes in U.S.